When Eileen Baker first walked into Oakwood Wesleyan Church in 1938, she had no idea what a massive role the parish would play in her life. Baker was fresh out of high school and had just moved to Toronto from Dundalk, Ont., a tiny town north of Orangeville, to study business at college. As a sister church to her hometown parish, Oakwood Wesleyan Church was a natural place for Baker to find community. It didn’t take long before the 20-year-old was appointed the church’s new treasurer — a move that completely blindsided her. “First thing I knew, I had the books thrown at me,” Baker says, her warm brown eyes crinkling at the corners. She took on the role, thinking it would be a year or two, maybe, until somebody better suited to the position came along. “That somebody didn’t come along. And it’s 75 years later and I haven’t found them yet,” Baker says with a laugh. Now 95 years old, Baker has been keeping a watchful eye over the church’s books for three-quarters of a century, guiding the institution through a series of ups and downs, from new pastors to new locations. She’s paid down six separate mortgages for the church — the first for $3,000, the latest for more than $460,000 — and current pastor Rev. Sule Prince says Baker is about to lead them through a major renovation of their current space at 33 Brandon Ave., near Dufferin and Dupont Sts. “He thinks that,” she says. “I don’t have any lease on life.” But she does have determination. When Baker broke her hip in late August, she continued to handle all of the church’s bills and finances as it healed. “I had the books right beside me in the hospital,” she says. Bills and receipts are scattered throughout Baker’s apartment, where she lives alone. Despite her constant dedication, she’s never asked the church for a penny, says Prince. “She’s a machine,” he says. A lot has changed in the past 75 years, from tax laws to technology. But Baker has kept up with it all. An accountant for more than 40 years, she takes pride in having closely followed the ever-changing federal regulations for church finances. She calls the Canada Revenue Agency frequently — so frequently they know her by name — to make sure every detail is taken care of. They always are. On occasion, Baker has even caught the agency’s slip-ups. “They make mistakes too, you know,” she says. The agency wrote to Baker saying she’s done her work well, and offered her the privilege of paying the church’s taxes quarterly instead of monthly. “But I like to still keep on doing it every month, because it’s easier to keep on doing it every month than to forget it by the end of the third month,” she says. Baker uses a computer to keep track of the church’s finances, but that doesn’t mean she’s embraced technology wholeheartedly. “I will not let them put the email thing on mine … I don’t want it,” she says, adding that she puts bills and cheques in the mailbox every Sunday. Oakwood Wesleyan Church has changed a lot, too, over those 75 years. It was once an all-white congregation, but after years of comings and goings, the church is now predominantly black. I felt, at the time,” she says. “To see some of them who’ve gone through university is really very nice.” Focused on her career and other commitments, Baker never married or had children of her own. “I’ve been too busy to think about that!” she says with a laugh. That certainly doesn’t mean she’s alone, however. “The church is my family,” she says. Baker moves a little more slowly now than she did when she first stepped foot inside Oakwood Wesleyan Church. 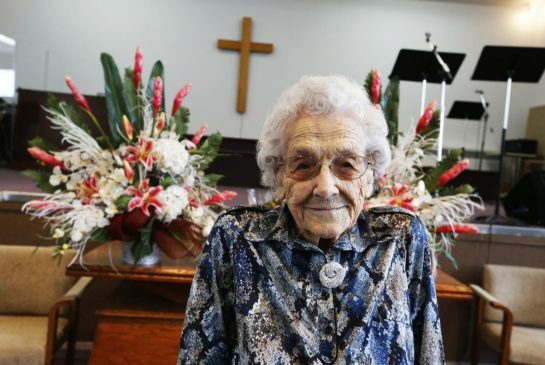 Her face is lined with smiles past, and she uses a walker to get around, but still tries to make it to church on Sundays. Looking back at her time as treasurer, day one is as clear as yesterday, Baker says. She thinks keeping the books helps her stay mentally sharp.